Originally, this front bedroom in a 1925 bungalow in the Houston Heights was wallpapered in a dark green and red floral. It was lovely, and went beautifully with the home’s vintage vibe. But the new homeowners (who have lived here many years, but are just now getting around to decorating this room) want to use this room as a home office, and they wanted something lighter and more modern. In the top photo, you see me stripping off this floral paper. 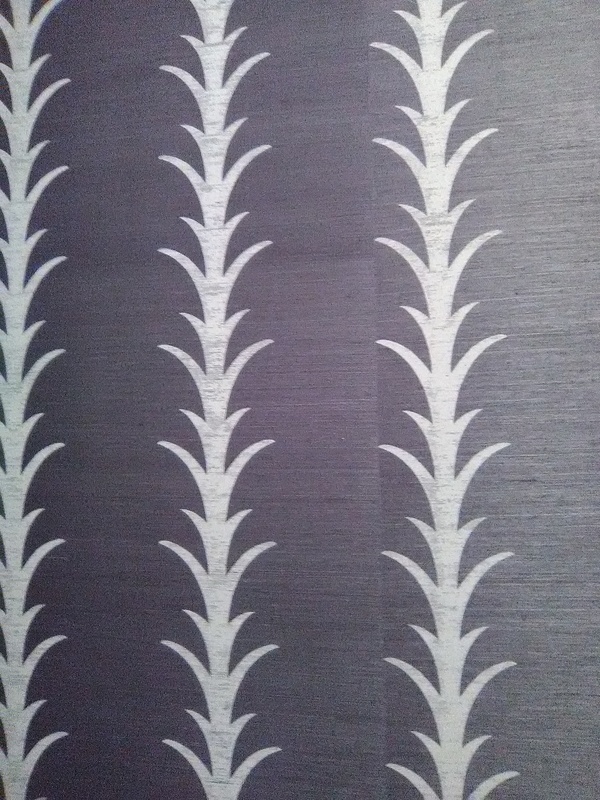 They were considering grasscloth, but, after reading my warnings about that product (see the page link to the right), they decided to avoid the color variations, staining, and fragility of that material, and instead went with a sort of faux grasscloth – this textured vinyl in a silvery grey color. The color of the new paper goes perfectly with the gray paint on the woodwork. The paper has vertical lines in a striped pattern, as well as subtle horizontal shading that mimic real grasscloth, but in a more controlled and pleasing way. 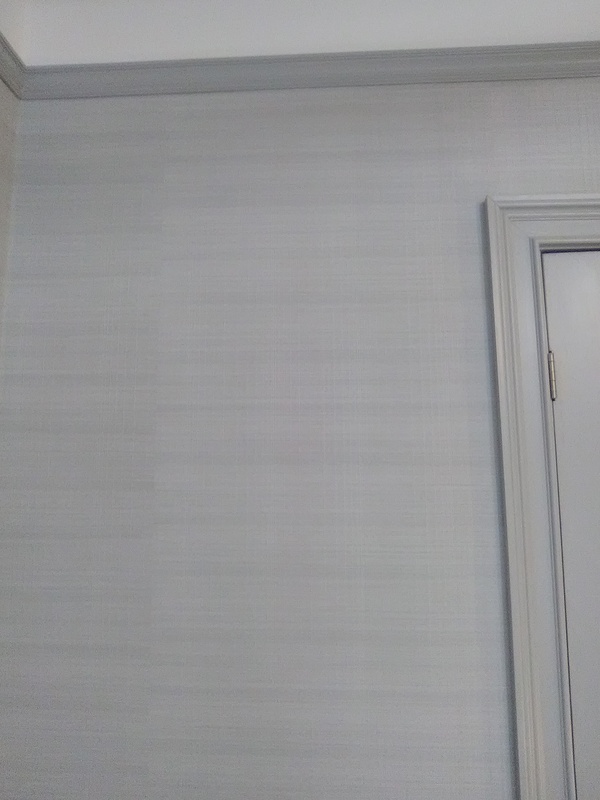 The commercial-grage vinyl is thick and durable, and will withstand bumps, splashes, and stains way better than most other types of wallcoverings. On my end, though, the vinyl material was very difficult to work with. It is thick and stiff, and it is on an Osnaburg woven fabric backing, which is much like canvas. It takes a really sharp razor blade and a lot of strength to cut through it. And because it is so thick, it’s very difficult to get it pressed up tightly against woodwork – so when you trim against the ceiling, doors, or baseboard, it’s very likely to get a gap that lets the wall behind it show. I have a special trim guide that makes a “fat cut,” which helps eliminate that gap. Because the wallcovering is made of vinyl, it traps moisture behind it, so when the paste behind it dries, there is nowhere for the moisture to go, so you get off gassing – which is a nice way of saying that the paper “burps” and creates bubbles. I had to continually go back and chase bubbles out of the drying paper. The design has a textured raised vertical stripe pattern. I had cut my first several strips with the intention to start hanging. Then I started measuring the wall, plotting the layout, and counting stripes. They were not laying out properly across the wall. 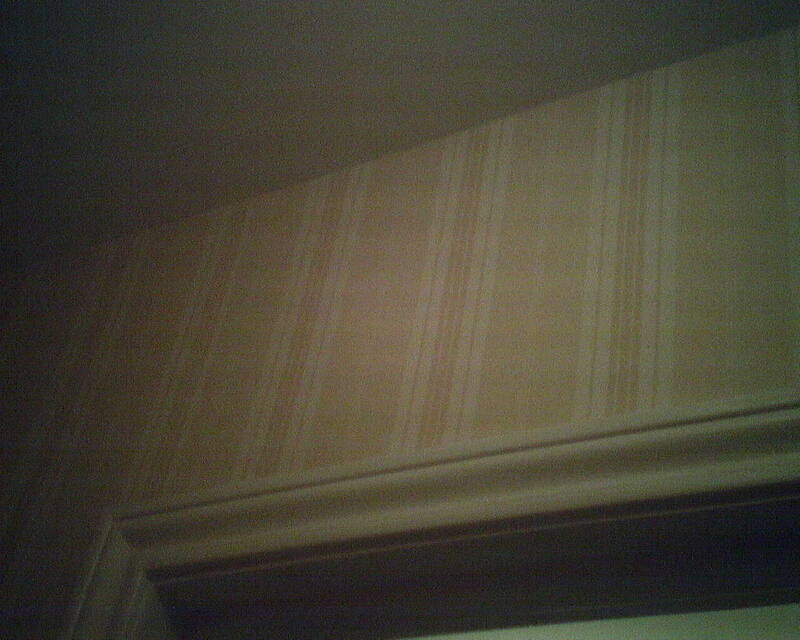 After studying the paper’s pattern for a while, I realized that the stripes on the ends of the paper would not be spaced correctly – unless paper was trimmed off the edges of the wallpaper strips. By removing 2.5″ from the edge, the stripes would be spaced correctly. I could trim this 2.5″ off, using my work table, a ruler, and my 6′ straightedge. 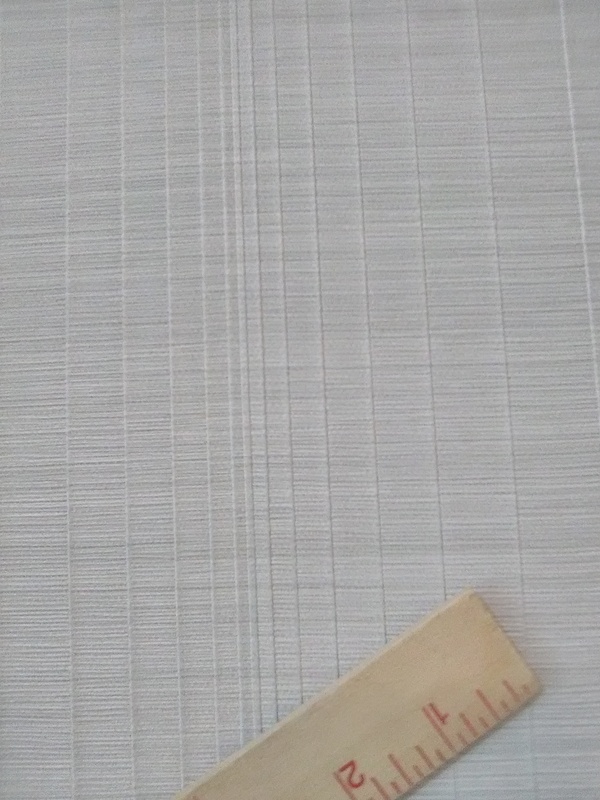 But the manufacturer’s trimming roller had left a slight beveled edge where it cut the paper. Since my hand-cut edge would be straight up, you would see an odd junction where my straight cut met against the manufacturer’s beveled cut at each seam. 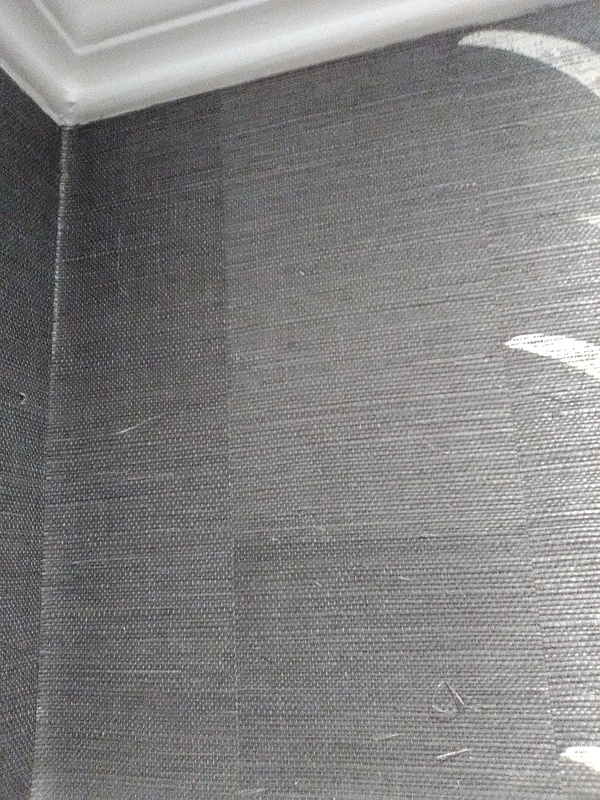 So the only option for a very smooth seam was for me to trim some off both edges of the wallpaper. This worked out to 1.5″ off one side and 1″ off the other. Which was complicated further by the fact that some of the bolts of wallpaper were 1/4″ – 1/2″ narrower than others. So much for quality control at the factory! But what this meant to me was that I had to carefully measure the width of each bolt of paper, compare that to the rhythm of the stripes crossing the paper horizontally, and determine how much to trim off each edge, in order to have the stripes be spaced correctly across the room. In real life, most people are not going to notice a spacing difference of 1/2,” or even 1.” Especially in a room with very dim lighting and tons of shadows, and a pattern that is difficult to see in the first place. But since I had to trim the paper’s edges anyway, it just made sense to trim it so that the spacing of the stripes fell as perfectly spaced as possible. Try as hard as you may, hand-trimming wallpaper, especially thick, heavy, fabric-backed vinyl, is not as accurate as what they do at the factory. Thus there is always the potential for slight gaps or overlaps at the seams. With a thin paper, it’s possible to stretch and manipulate the material to make a good seam. But with this thick vinyl, I expected to see these gaps and overlaps. However, I was amazed that the vinyl was more malleable than expected – every single seam melted together perfectly. Although the specs said that the trimmed paper would be 25″ – 26″ wide, by the time both edges were trimmed off and the stripes spaced as they should be, the paper was actually only 24″ wide (give or take an extra 1/4″ or so). Lose 2″ on each of eight strips going across a wide wall … and that can screw up your engineering of the wall and your plans of the number of strips needed and how many bolts of paper will be required. 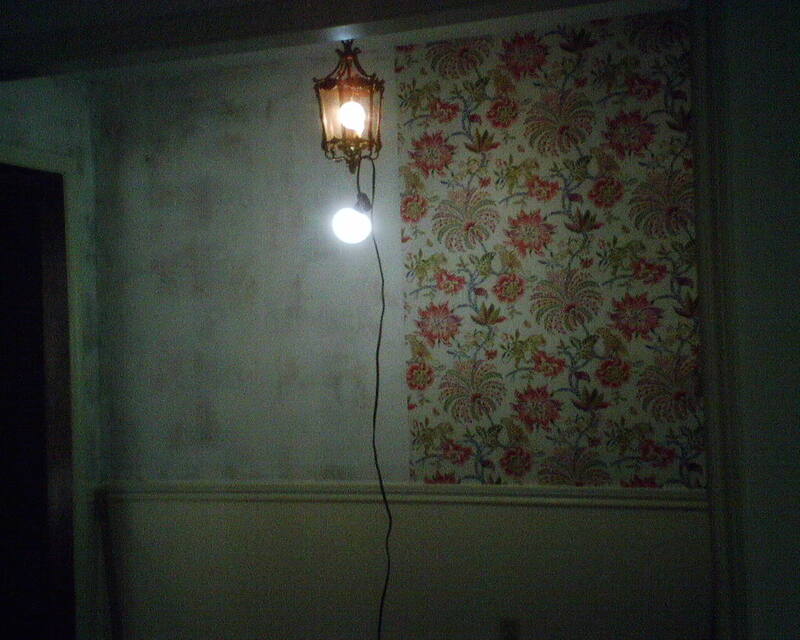 All of this fiddlin’ and futzin’ took a lot of time, and I was only able to trim and hang paper on two walls each day. So, with prepping the walls and hanging the paper in this … it was something like a 16 single roll room… it took me a full three days. Which is what I had planned on, so we stayed right on schedule. There was no brand name, so I don’t know the manufacturer, but the label said “JL 8008.” This commercial-grade paper is available in the 27″ width (which is what I can work with) or the wider 54″ (which is more for commercial settings). It was bought from my favorite source for good quality, product knowledge, expert service, and competitive price – Dorota Hartwig at Southwestern Paint on Bissonnet near Kirby. (713) 520-6262 or dorotasouthwestern@hotmail.com. She is great at helping you find just the perfect paper! Discuss your project and make an appointment before heading over to see her. 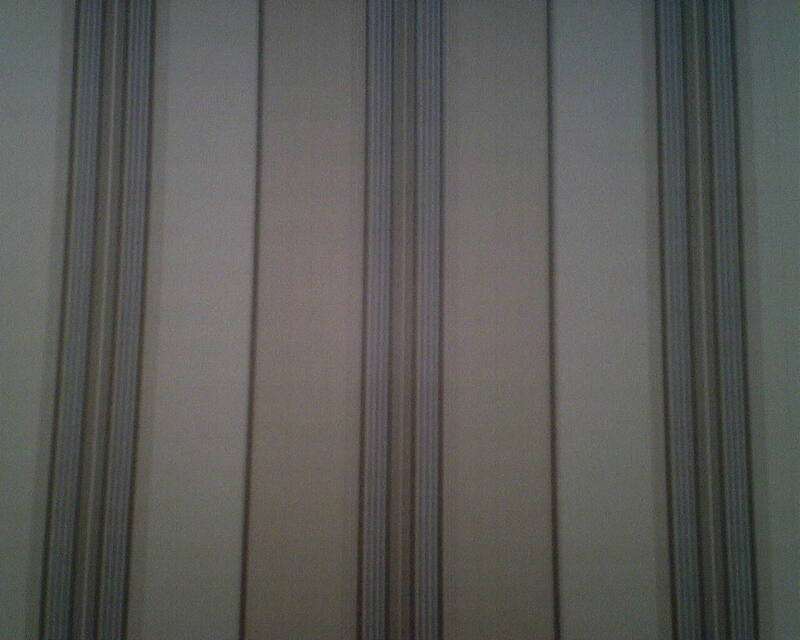 Here is an acanthus-themed wallpaper pattern worked into a stripe, superimposed onto grasscloth. The manufacturer is Schumacher, and I hung it in a powder room and an adjoining shower vestibule in a home in Bellaire. I’ve worked for this family several times over the last 20 years. Usually, I have problems of sundry description with the Schumacher brand products; this time, there were no major issues. At first glance, there is nothing wrong with the original striped wallpaper in this dining room of a home in the Champions area of Houston. In fact, it has been performing well for nearly 30 years. The only problem is that it’s outdated. This home was damaged by the flooding that came with Hurricane Harvey last year. 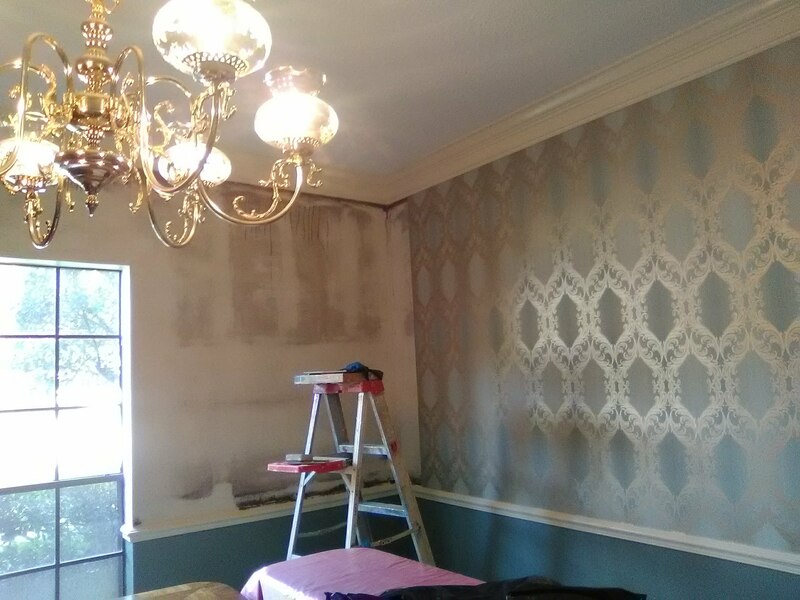 So while the homeowners were replacing floors and drywall and appliances, they decided to replace and update the dining room wallpaper, too. 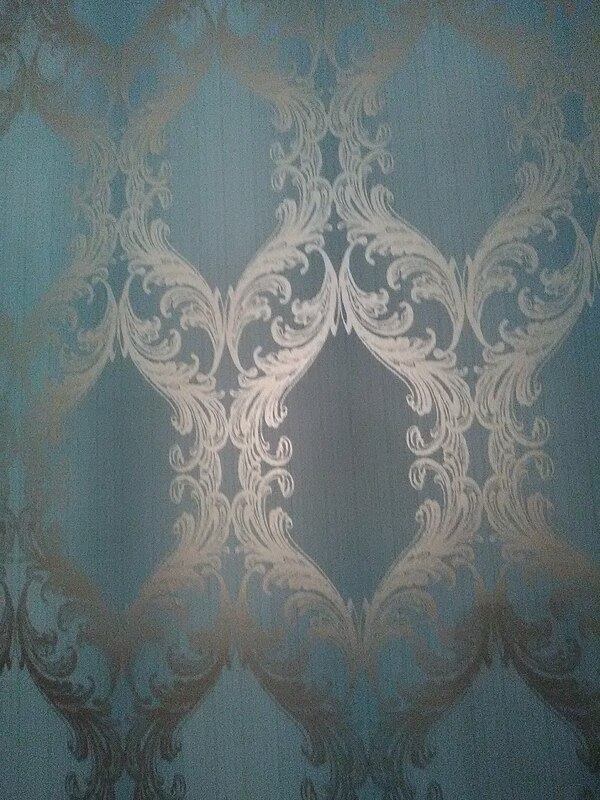 This damask / trellis pattern has some unusual shading effects. From certain angles, it looks like there is a shadowy stripe running vertically through the design. But from another angle, you see an alternating depth of color (light, dark) running horizontally. 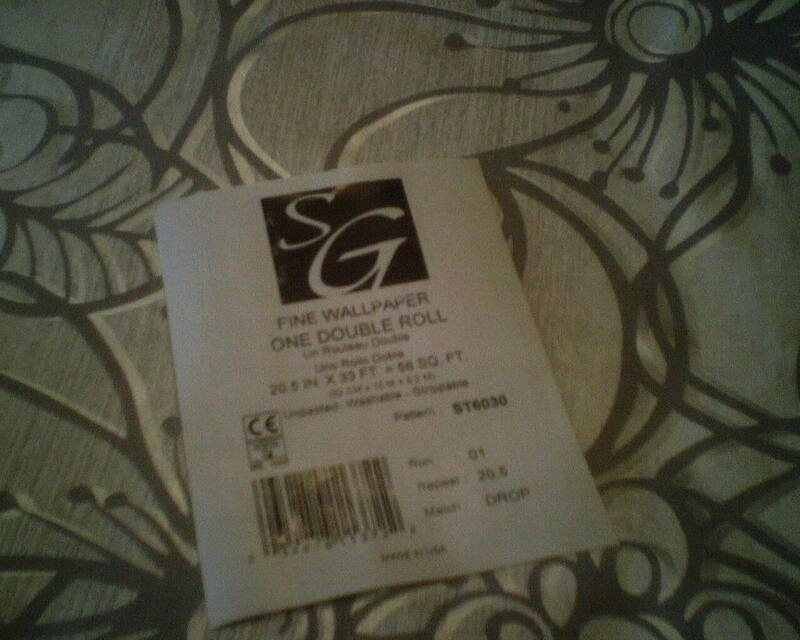 In addition, the printed design of the wallpaper has a metallic sheen to it. This adds life and energy to the room, and also ensures that the dining room feels young and up to date. 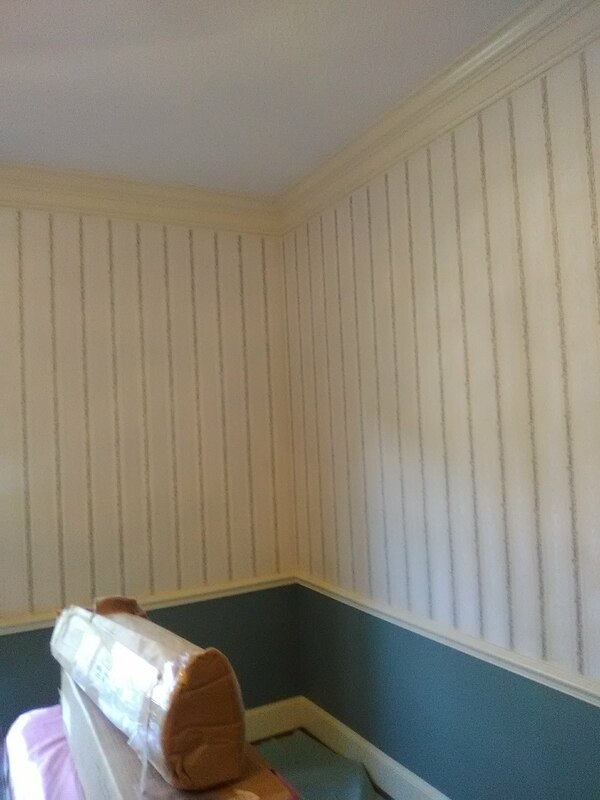 The homeowner thoughtfully chose the blue-green color paint at the bottom of the wall, to coordinate with the wallpaper. The darker color at the bottom of the walls helps ground and balance the room. 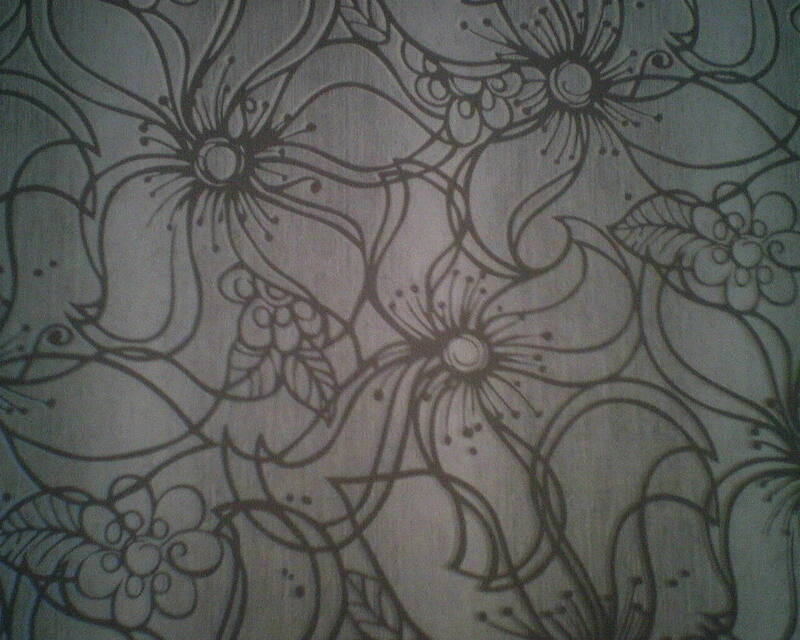 This wallpaper pattern is by York, and has a “raised ink” texture. It was bought at below retail price from Dorota Hartwig at Southwestern Paint on Bissonnet near Kirby. (713) 520-6262 or dorotasouthwestern@hotmail.com. She is great at helping you find just the perfect paper! Discuss your project and make an appointment before heading over to see her. 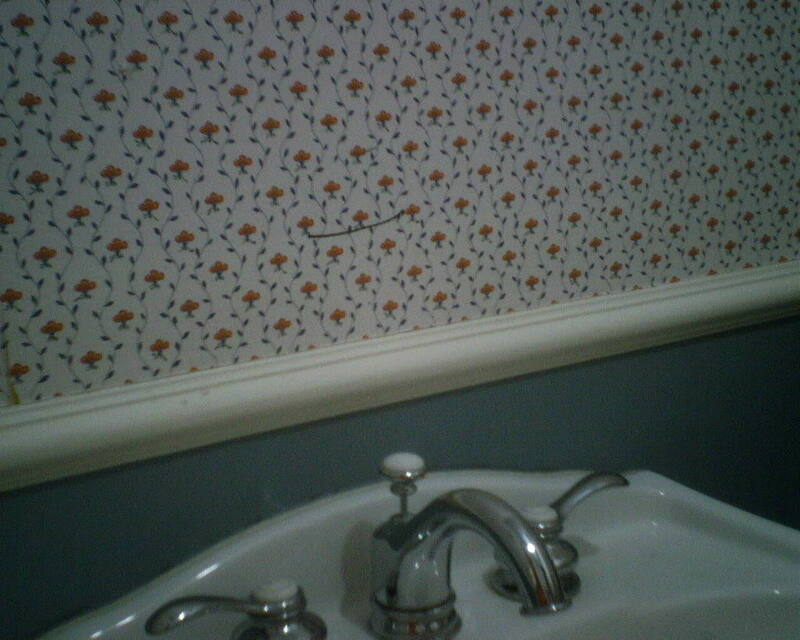 The tiny red and blue floral wallpaper pattern looked great in this Tanglewood powder room for a decade or more. But when the homeowners wanted to freshen up the look of the house, the interior designers moved toward a more sophisticated look, and they chose this muted stripe pattern. It’s more subdued, and it really goes nicely with the blue paint below the chair rail. The interior designers for this job are Neal LeBouef and Anthony Stransky of L Design Group, a Houston-based company. 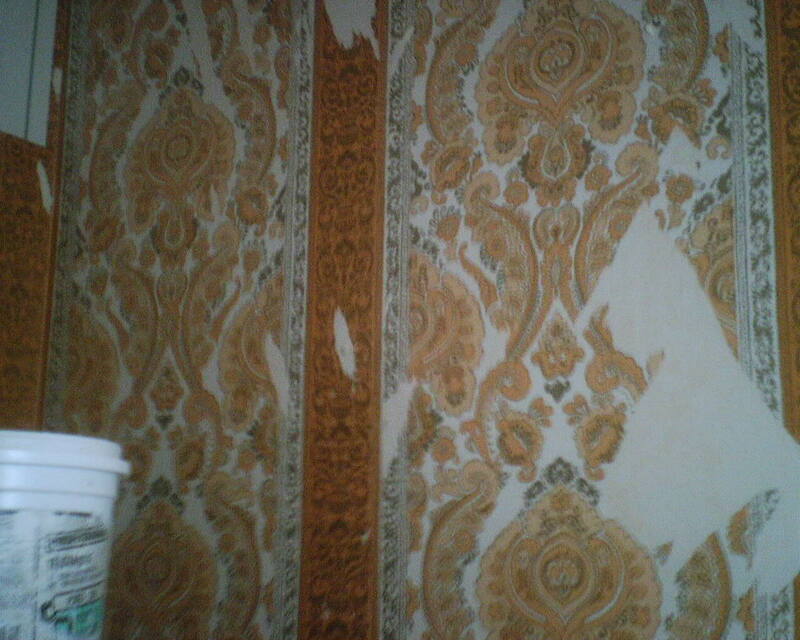 The wallpaper is a pre-pasted product by Sure Strip, and is in the Waverly line. It goes up easily, and is designed to strip off easily later, when it’s time to redecorate. I love this particular product. Out of the ’70’s and Into a Bright Splash of Color and Fun! 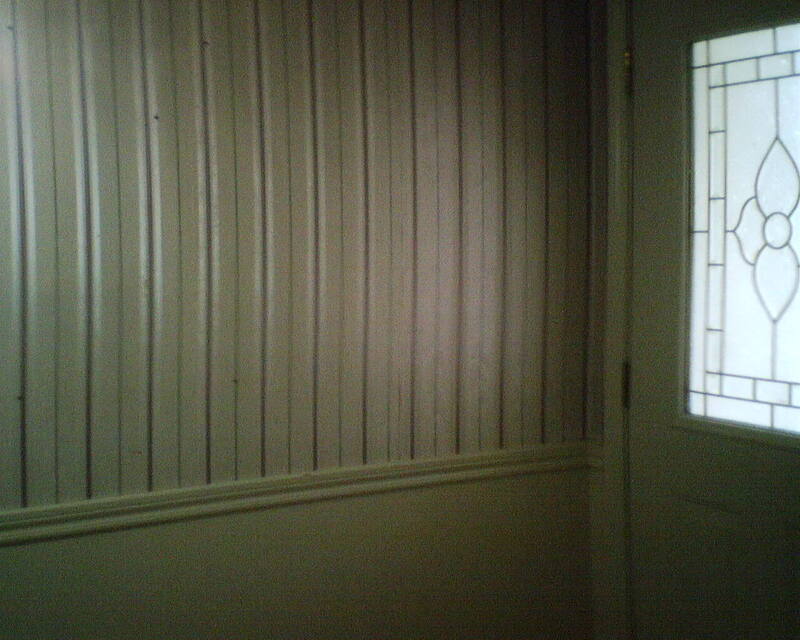 The top photo shows the entry of this ’70’s ranch style home in far west Houston in it’s ’90’s era shiny, striped, vinyl wallpaper. Once I stripped that off, below it was revealed the original wild orange and gold ’70’s era paper, which you see in the second photo. 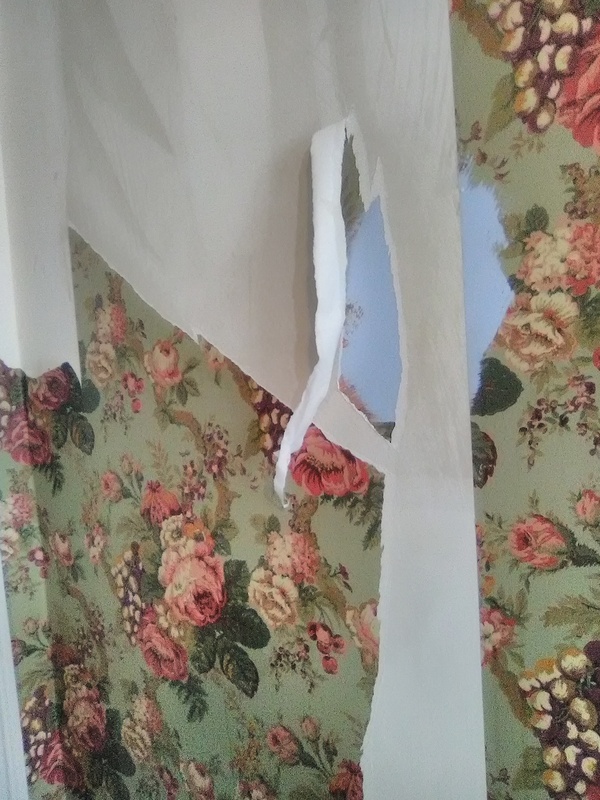 That orange paper would not come off without damaging the Sheetrock (because the previous installer had not primed the walls), so I prepped the seams, sealed the paper, primed it, and then hung the new paper over it. The third photo shows the new paper going up. I love the picture, because it shows the dramatic transformation. What a wild punch of color, and a cherry, fun pattern – and a little wildlife, too! 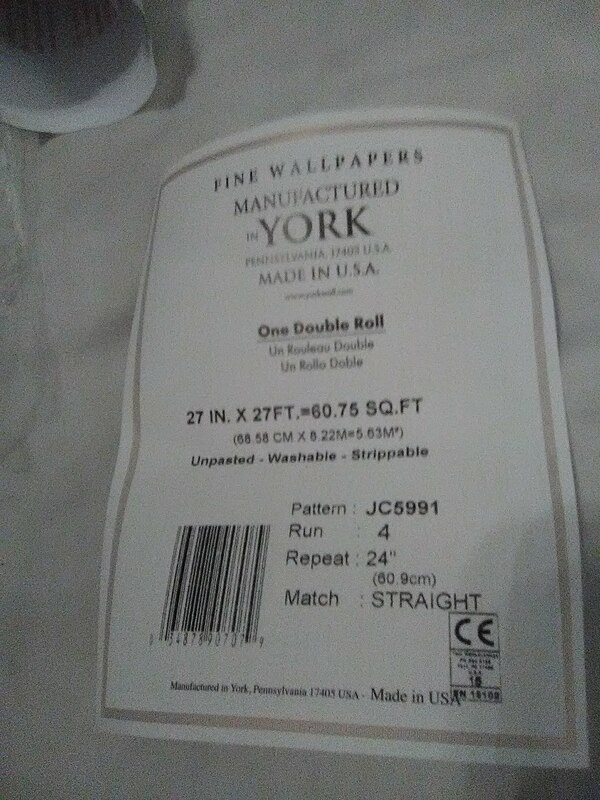 The new wallpaper is by York, in their Sure Strip line, which is a pre-pasted, non-woven material that is designed to strip off the wall easily and with no damage to the wall, when it’s time to redecorate. I love their products. 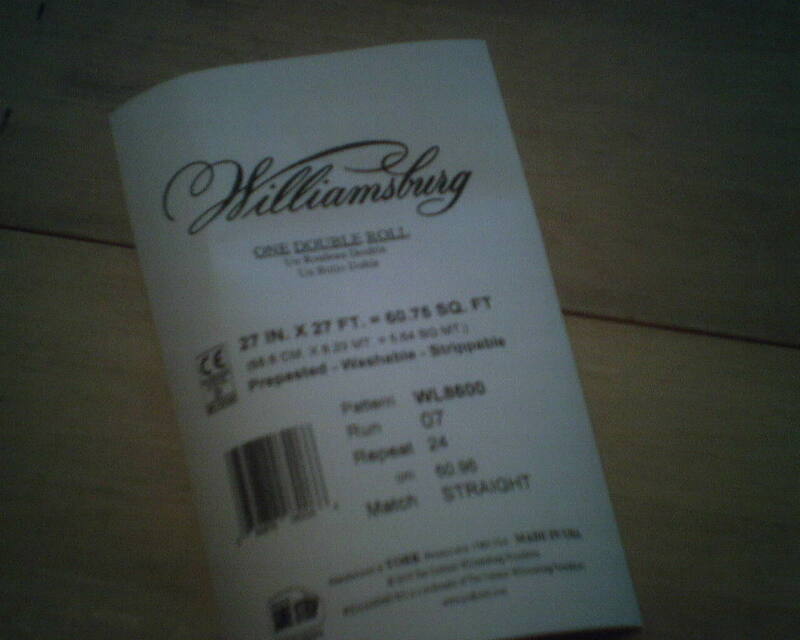 This pattern is in their Williamsburg collection. It was bought at below retail price from Dorota Hartwig at Southwestern Paint on Bissonnet near Kirby. (713) 520-6262 or dorotasouthwestern@hotmail.com. She is great at helping you find just the perfect paper! Discuss your project and make an appointment before heading over to see her. The “kill point” is where you land your last strip of wallpaper. When it meets up against your first strip – which is usually in a corner – it almost always results in a mis-match of the pattern. And pattern mis-matches catch and jar the eye. So that’s why you try to hide the kill point in a corner or behind a door, or somewhere where it won’t be prominently displayed. 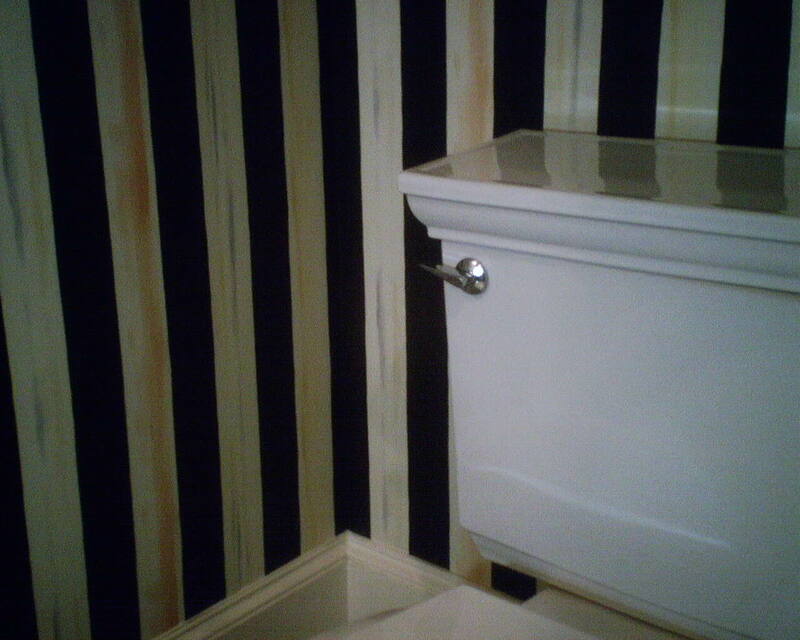 But this bathroom didn’t have a “hidden” corner where the mis-match would not be noticed. I was going to end up with two 8′ lengths of the wide white stripes closer to each other than they should have been. So I decided to match the pattern correctly in the corner, and then move the kill point up and away from eye-level – to over the door. 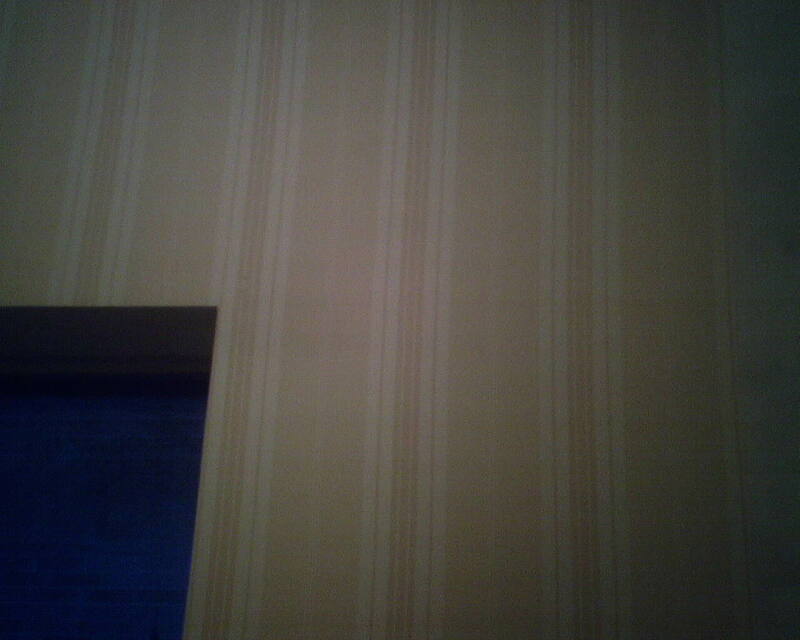 On the right side of the photo, you see the stripes at their normal width. As you move to the left, though, there is one stripe that is not the same width. This is my kill point. The thing is, even though that stripe is narrower than the others, it doesn’t scream at you; your eye passes right over it. 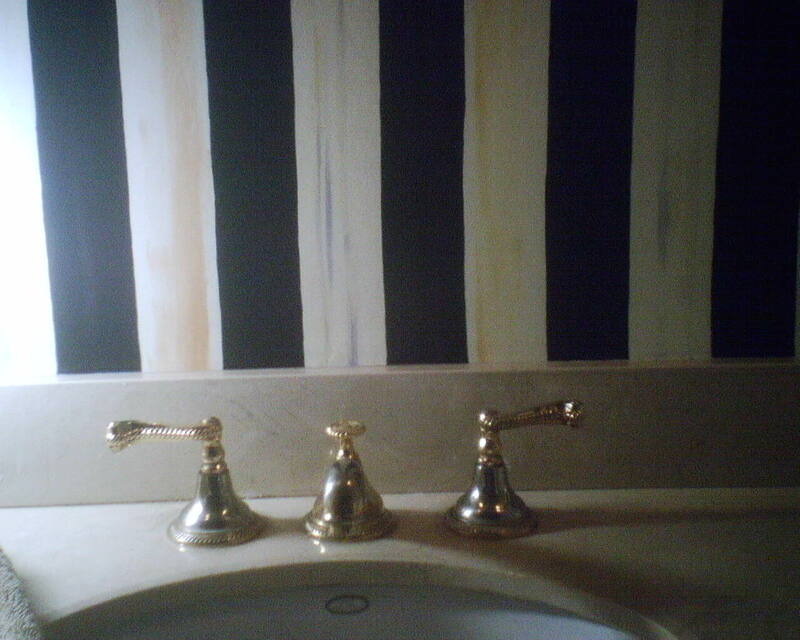 This dusty yellow striped wallpaper pattern went in the potty room / water closet of a master bathroom. 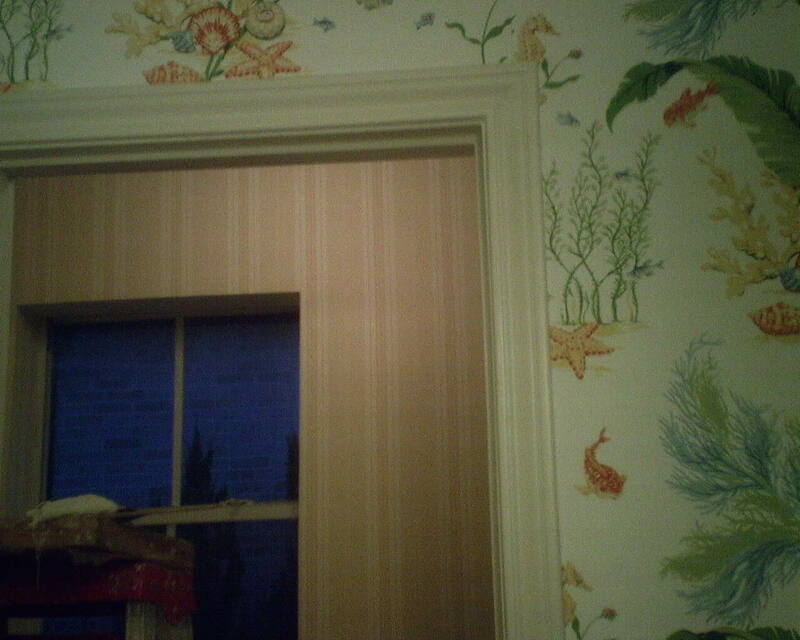 In the larger room, the homeowner wanted a brightly colored, nautical-themed wallpaper. 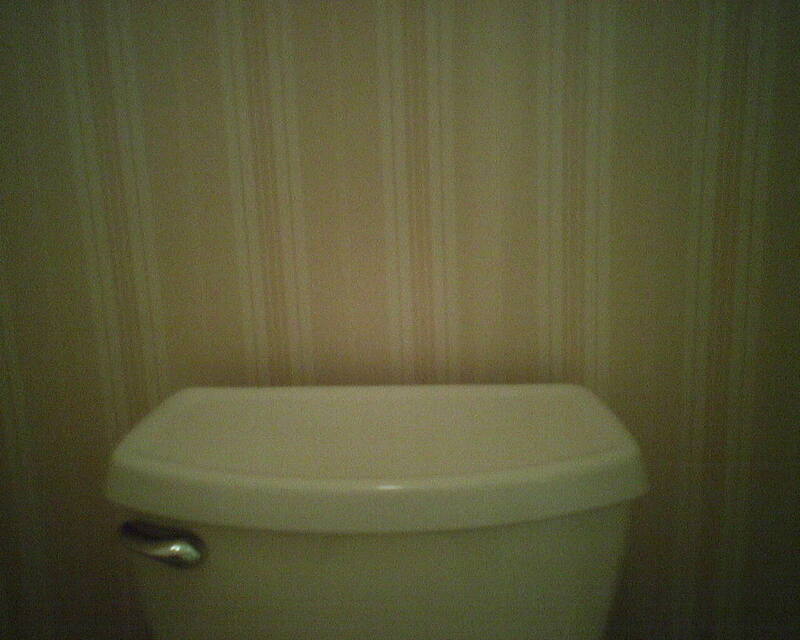 She chose this more muted color and subdued pattern for the smaller commode room. 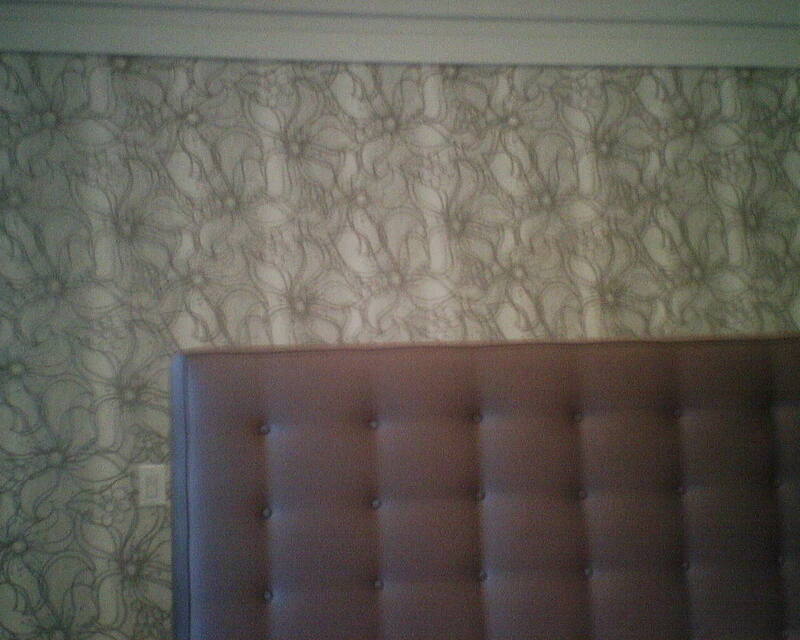 I really like the idea of companion / coordinating wallpaper patterns in adjoining rooms. All it takes are colors from the same family, and design themes that are in the same league. This is a perfect example. 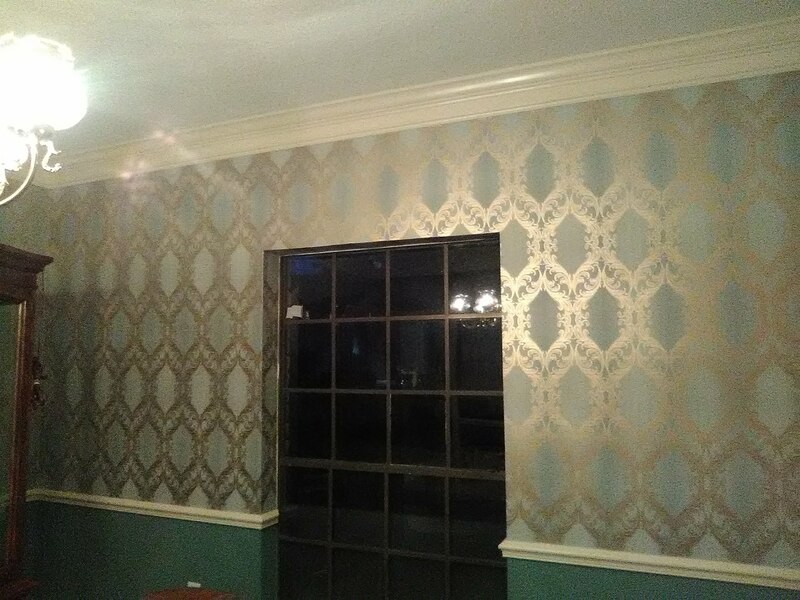 This wallpaper pattern is by Thibaut Designs, and was bought at below retail price from Dorota Hartwig at Southwestern Paint on Bissonnet near Kirby. (713) 520-6262 or dorotasouthwestern@hotmail.com. She is great at helping you find just the perfect paper! Discuss your project and make an appointment before heading over to see her. Cute Wallpaper – But It’s Time To GO! 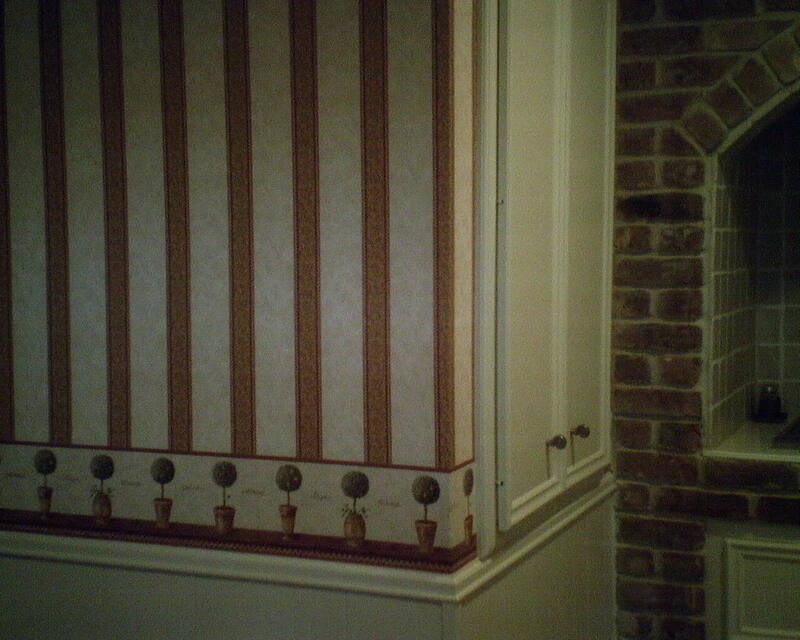 This striped wallpaper design with coordinating topiary border was very cute, yet sophisticated – back in the ’90’s. The homeowner is a realtor, and is up-to-date on decorating trends. She is ready for something more modern in her kitchen and breakfast room. 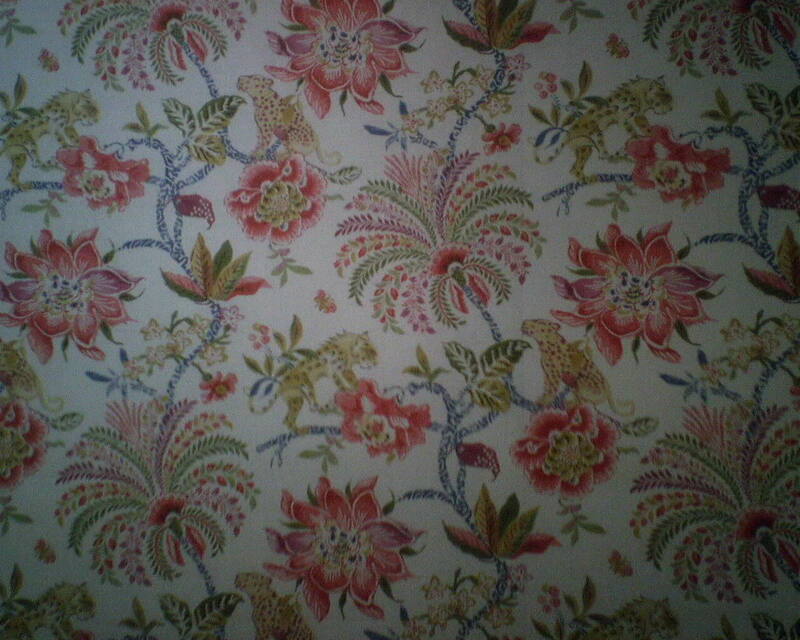 I stripped off this wallpaper today, and, most likely, the homeowners will prime and then paint the walls, rather than rewallpaper. The home is in Tanglewood (Houston). 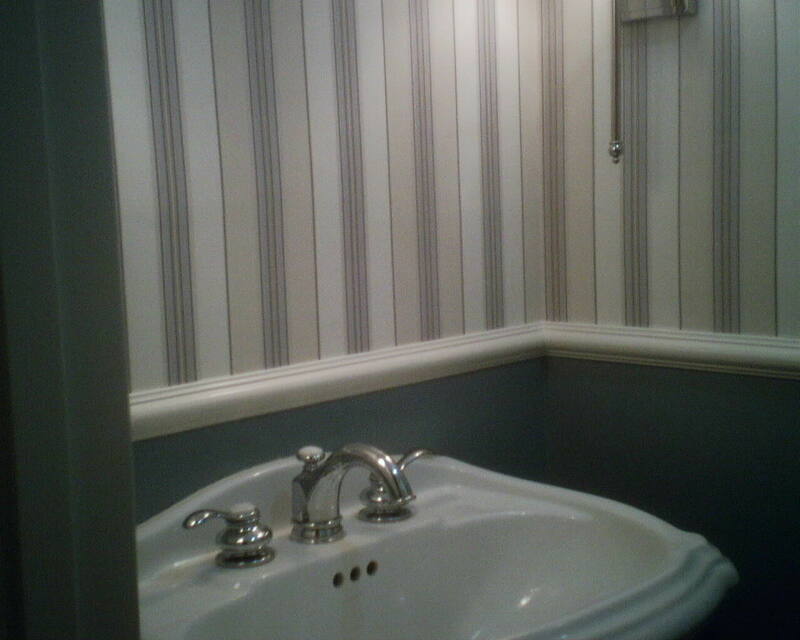 This powder room is in one of the traditional Georgian style homes that were popular with builders in the West University Place area in the 1990’s. 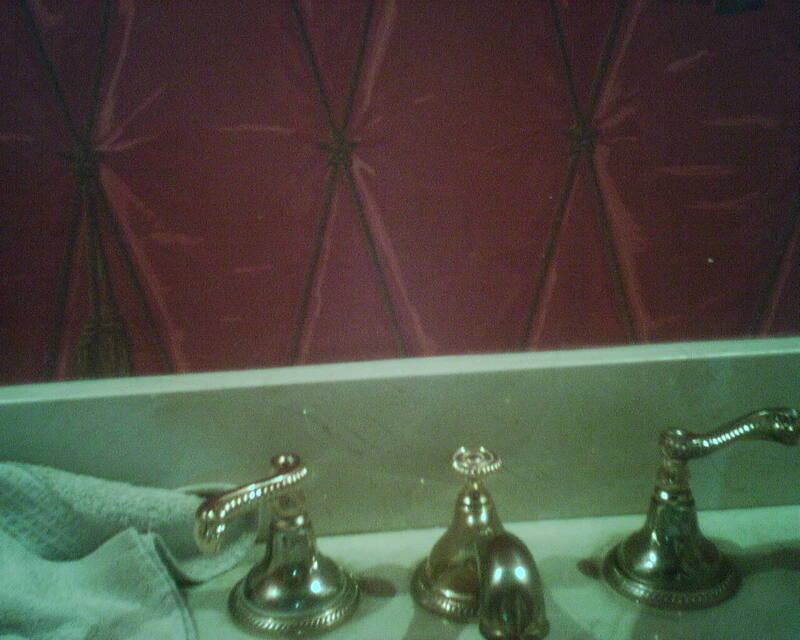 The original tufted-wall wallpaper went perfectly with that era and style home. But the new owners are a young couple with school age children, and the mom wanted some “Wow!” factor. She fell in love with this bold stripe. What makes it unique are the child-like swaths of color in between the black stripes. The original dark red paper was on all walls, the sloped ceiling under the stairs, and even the ceiling itself. To me, it seemed dark and crowded. The homeowner agreed with me to not repaper the small flat ceiling area. But there was a lot of debate over whether or not to paper the sloped section. Once all the walls were papered, I tacked some strips to the ceiling, so she could get a feel for how the room would look and feel with paper overhead. The decision was to go ahead! I don’t usually like wallpaper on overhead areas, but this time I have to say that I think she made the right choice. 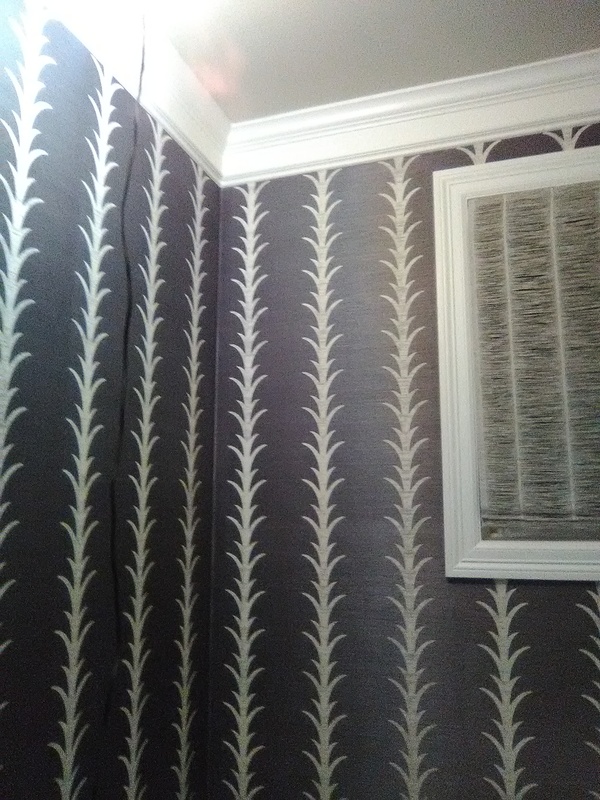 This McKenzie Childs wallpaper pattern is a bold choice for this small room, and will take some accessorizing to really make it work. There is a huge rectangular mirror that almost totally covers the wall behind the sink. The medium-brown vanity will be painted a soft smoky blue, to coordinate with the blue in the paper. And the wall that faces you when you walk into the room will get a large piece of abstract art, with reds, yellows, greens, blues, and, of course, black, which will really stand out against the paper. And that’s just what the homeowner wanted … opening the door to the powder room and stepping into a wild and unexpected experience. 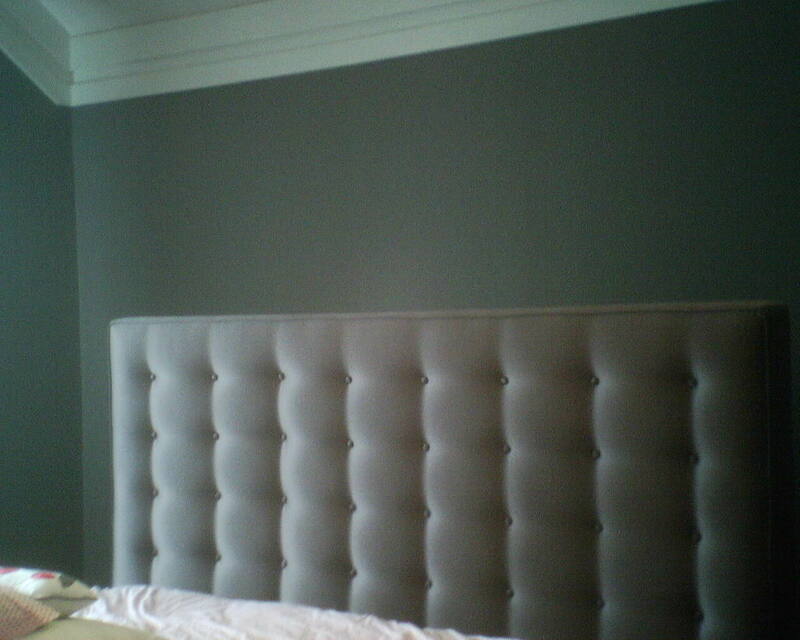 The “before” image is good enough – a grey tufted headboard against a deeper grey wall. But in the “after” shot, you see how pattern, color, movement, and depth create a more interesting and inviting setting for this master bedroom. Just about everything in this house is grey. Walls, furniture, tile floor, rugs, dishware, dog bed. Grey can easily feel cold, but accents like this wallpapered wall, and pops of color in accessories and artwork, plus textured fabrics and furniture with curves all keep the scheme from feeling too austere. When playing with the pattern layout on the floor, all I could see was the floral pattern. 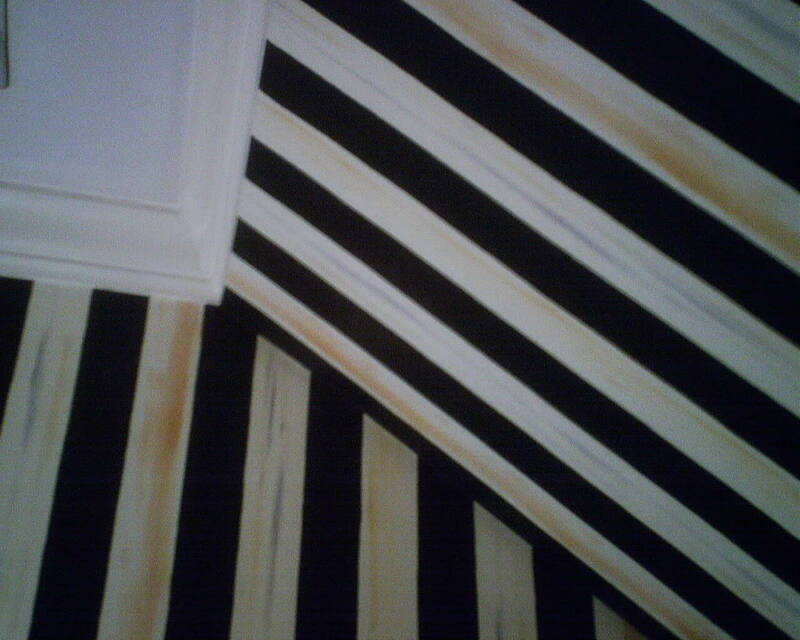 But once a few strips were up on the wall, the vertical stripe design became very obvious. This is a good reason why I urge clients to always look at the room-set photo in the selection book, so you can see not just the primary design, but how the pattern will play out across a larger area. 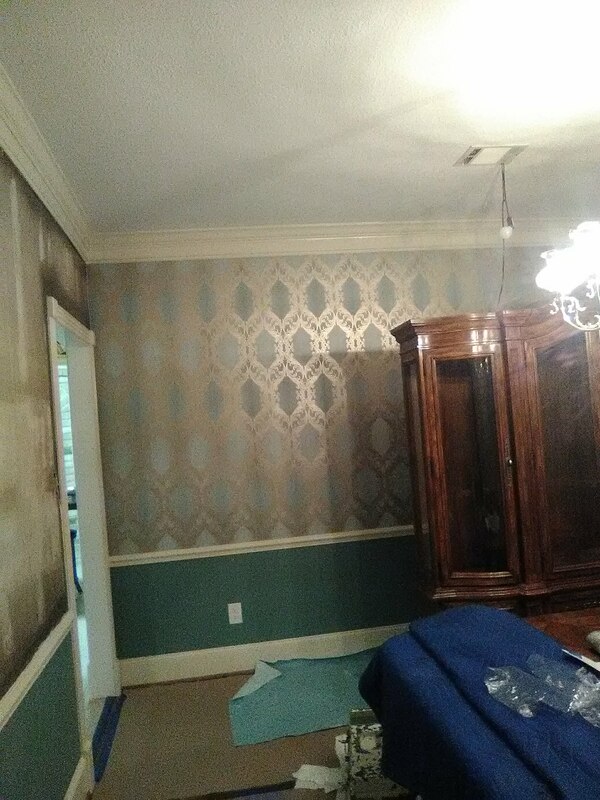 This wallpaper pattern is from the SG line by York Wallcoverings, and was bought at a discounted price from Dorota Hartwig at Southwestern Paint on Bissonnet near Kirby. (713) 520-6262 or dorotasouthwestern@hotmail.com. She is great at helping you find just the perfect paper! Discuss your project and make an appointment before heading over to see her.